What overall characteristics are seemingly shared by dinosaurs and modern birds? Not all dinosaur characteristics are similar to those of modern birds, but there are many similarities. For example, some dinosaurs had features such as bony tails, claws on the fingers, beaks, and on some, feathers. Feathers are only one major characteristic that links dinosaurs to birds, including such feathered dinosaur fossils as the Archaeopteryx lithographica, and specimens found in other parts of the world, such as the Sinosauropteryx prima from northeast China. All these fossils exhibit feather-like impressions in the sedimentary rock in which they were found. Other characteristic links between dinosaurs and birds involve certain skeletal similarities. For example, fossils of the dinosaur Deinonychus have many bird-like characteristics: the large head was balanced on a slender, almost bird-like neck; and the chest was short, with the arms folding inward in a resting position, similar to the wings of a bird at rest. The creature’s foot had a huge claw on the second toe. In many ways, the feet of the Deinonychus resembled an enlarged representation of a bird’s foot. Birds share over 130 physical traits with dinosaurs, and some species look remarkably like dinosaurs with feathers—for example, birds in the ratite family, including ostriches, emus, rheas, and this cassowary from New Zealand. 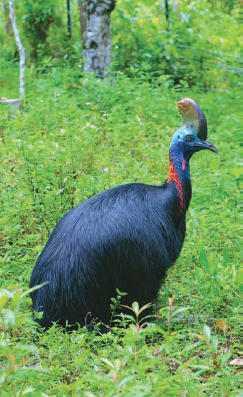 The cassowary even sports a head crest reminiscent of animals like the Dilaphosaurus (Big Stock Photo).